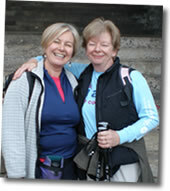 It’s April 28th and with Paddy’s words (the Australian group’s guide) echoing in our head, we set off. According to Paddy, it’s going to be awful weather – what can you do? 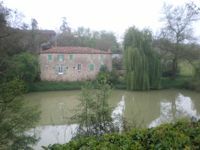 We set our positive head on and call in to the local boulangerie for pizza and quiche for lunch and leave Condom along the river. A lovely path but the river is still really murky as all have been on this trip so far. It must be all the mud etc that’s been washing into and away by the rivers. Soon we are leaving the river and walking through a residential area and are then passing under the railway line and heading uphill. There are three men ahead all walking together and we’re enjoying being on the move again. Suddenly though there’s a harsh cry and at first we’re not too sure where it’s coming from until Teresa informs me that I should look up and there in the tree right above my head is a peacock. Not quite what I’d expected. 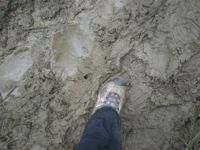 Mud out in full force again this morning – so wish I’d thought this one through and brought my gaiters like Teresa. Our first place on the map this morning is Le Carbon and at this point we have a choice, either continue on the path or take the detour to Larresingle, a tiny fortified town. 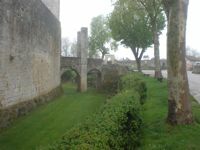 This was the fortress of the Bishops of Condom in the Middle Ages. 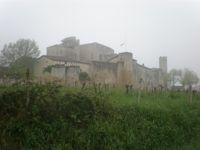 The castle was built in the second half of the 13th century and it was Arnaud Orthon de Lomagne, who was the Bishop between 1285 and 1305 who added the second and third floors. 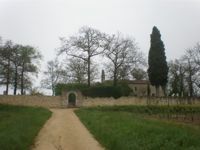 The ruins have been listed since 1922 as a monument historique. 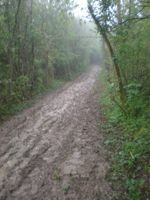 Sadly it just started to rain after we arrived so we had a quick walk around and then did what any sensible person would do, stopped at the cafe for some hot chocolate and time to look at the route ahead and use the loo. At least it was warm and cosy in here. Before leaving the town we visited the church and in there found one of the pilgrim stamps so put on in our books, this felt very special to us. Now from a walking preference Teresa and I would always choose paths over roads but I have to say that at this stage we were more than happy to be walking on roads for a few miles. So much easier than continuously having to try and retain balance. One of the places we were looking forward to getting to on today’s section was the Pont d’Artigues. 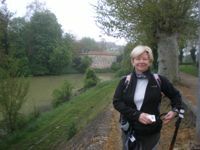 This bridge was built in the Middle Ages to enable pilgrims going to Saint Jacques de Compostela crossing the Osse. 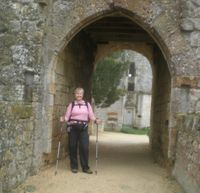 It has been trodden by many feet for over 800 years! 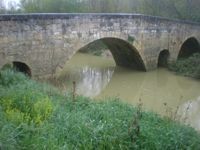 The bridge has four unequal was built on the site of an ancient Roman bridge for the pilgrims of Saint Jacques de Compostella. In the Middle Ages there was a hospital too and a chapel run by the Knights of St. John of Jerusalem. Because of fear of collapse access across the bridge is banned except for those on the GR 65 which crosses the bridge. The bridge was listed as a World Heritage Siteby Unesco under the Ways of Saint Jacques de Compostela in France . It was about 12.45/1.00 when we saw a chapel in the distance and remembered Paddy’s words that this was the only place to shelter if it was wet. We decided that if it was on the path we’d use it as a stopping place for lunch and it was a great move. A large covered porch gave us room to spread out and a well positioned wall acted as both seat and table. 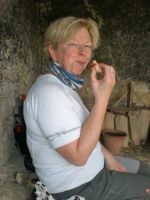 Teresa enjoying lunch, always great to have in the fresh air after many hours of activity! 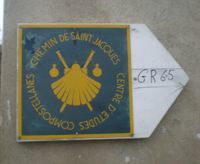 The Church is the Eglise de Routges and is the oldest church in the region. Our guide book pointed out the small door in the side which was an entrance used by the Cagots, an outcast population of uncertain ethnic origin. These people were found mainly in this part of France and lived segregated until the end of the 19thC. They were not allowed to be buried in cemetries used by the rest of the population and were believed to be evil and to carry diseases. 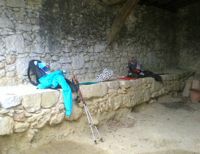 From this ideal lunch spot, our journey for today was nearly over, only about 4 Km left and thankfully the rain had stopped. 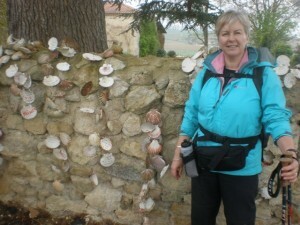 About a kilometer or so futher along we came across a fabulous wall outside a house. 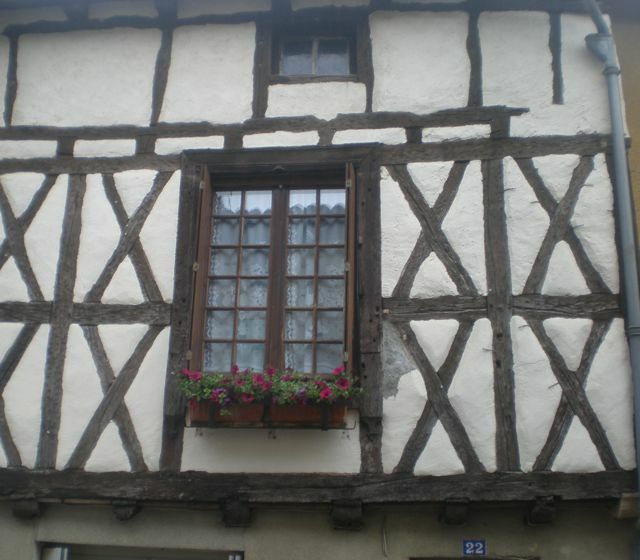 It was clearly a B&B or a ‘refuge’ for pilgrims. 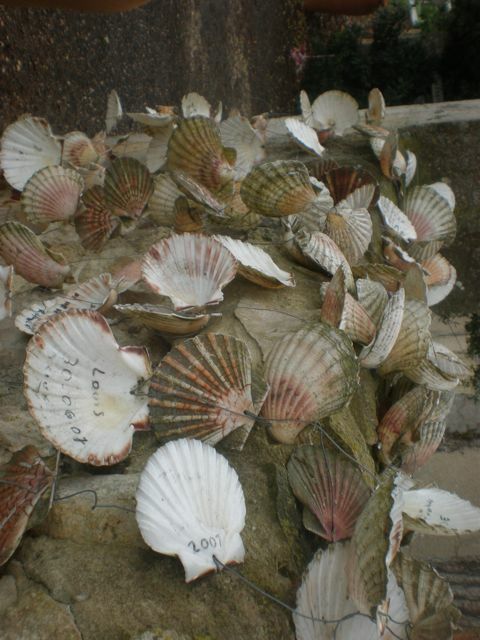 Seems like they got everyone who was staying there, and doing the Camino, to write name and date on a scallop shell. As you can see there were so many shells and people from all over the world. Not seen anything like this before. Walking into Montreal was like walking into a wild west down. There was virtually no-one around and even when we got to the small square things were not much more active. We called in at the tourist office to find out where our hotel was and as it was on the way out, near the town boundary, we decided to have our end of day beer. 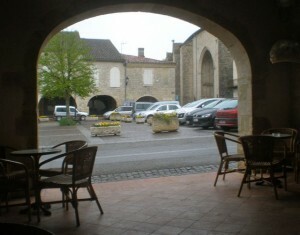 We sat outside but the bar, yet under cover from any rain that may come and took it in turns to go and see the church but as we neared the end of the beer, it was clear we weren’t warm enough to try for another. 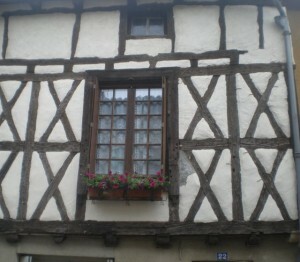 Wonderful old buildings, well refurbished. Seems to be a lot of money around some parts of France for this type of work. As this was part of a long weekend, May Day weekend, we went to the patisserie and boulongerie to make sure that they would be open for us to get food the following day. With that information, we could concentrate on finding our accommodation knowing that we could buy provisions tomorrow. It’s good that we don’t always know what’s in store….. knowing that we had a walk to our place to stay was one thing but then when you are shown into a room with a double bed and there should be twin beds, things become a little of a challenge. We talked to the lady who informed us that there were no twin bedded rooms, we called Alexandra, our contact in France and we accepted a drink down in the farm kitchen. To cut a long story short it was the mistake of the daughter and short of moving to her partner’s house miles away, we agreed to a camp bed which I said I’d sleep on. Good to get that sorted, next was to dry socks and things out, get some heat on, have showers and chill. Dinner was a communal affair hosted by the daughter and her partner and there were the two of us and then a group of people from Grenoble who were all walking the Camino. They had finished today and would be heading back tomorrow. The meal was amazing. We started with an aperitif of the area – Floc de Gasgogne Rouge which was delicious, note - get some of that to take home. Then we had a soup from a huge pot placed in the centre of the table. Next was a pasta salad followed by duck hearts accompanied by potato and vegetable gratin and the desert was a chocolate rice pudding with raisins. All through the meal, we had some great stories of the farm, it’s history, the work that madame does etc. So lovely to share evenings like this. Both a culinary experience and a social event.